On September 4, 2017, the meeting of the Working Group (WG) on Implementation of Integrated Water Resource Management and Adaptation to Climate Change was held in Tashkent. The event was organized within the framework of the meeting of regional organizations held by CAREC and SIC ICWC. The meeting was organized in two parts. The first part of the meeting was combined with the session “IWRM implementation in the Central Asian countries: lessons learnt, challenges, and future plans” of the 5th meeting of regional organizations involved in sustainable development and water management in Central Asia. In addition to the Group members from Uzbekistan (Mr.D.Paluanov) and Kazakhstan (Mr. D.G.Sagadiev), a representative of the National Water Partnership from Tajikistan (Mr.Ya.E.Pulatov) shared his country’s experience in IWRM. 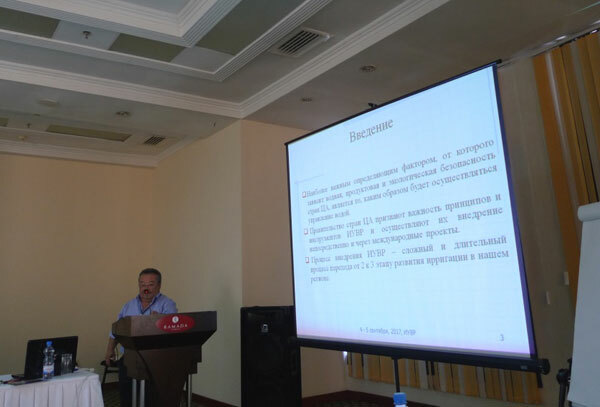 Mr. N.N.Mirzaev (SIC ICWC) made a presentation on the “Regional review of IWRM implementation in Central Asia.” Moreover, CAREC presented information on IWRM implementation along small transboundary rivers in Central Asia (Mrs. A.Inozemtseva). Then a narrow-format meeting was held with Messrs. Sagadiev D.G. (Ministry of Agriculture of Kazakhstan), Paluanov D. (Scientific Research Institute of Irrigation and Water Problems), Dukhovniy V.A. (SIC ICWC), Mirzaev N.N. (SIC ICWC), and Mrs. Ziganshina D.R. (SIC ICWC). They discussed progress on Activity plan 2017 and the structure of national and regional reports that would be submitted at the Anniversary Conference of ICWC in November 2017. They also discussed WG activities to be fulfilled until the end of 2017 and preliminary Activity plan 2018. Progress with IWRM implementation at country level? What problems occur when implementing IWRM? What steps should be taken for successful implementation of IWRM as a tool of green growth and adaptation to climate change in short-, mid-, and long-term? Economic and financial stability in management. Hierarchical levels of water management: national, basin, system (irrigation system level), and local (WCA, water user). It is also needed to show the situation with national IWRM plans and the role of IWRM in adaptation to climate change. 2. Working group members would submit the first version of the reports to SIC ICWC by October 25, 2017. 3. SIC ICWC (Mr.N.N.Mirzaev) would consider reports and present a regional report “Regional review of IWRM implementation in Central Asia” for consideration to the working group members by the Anniversary Conference of ICWC in Tashkent in November 2017. 4. Underline the work undertaken by SIC ICWC and CAREC on development of the interactive map on the use of water, land, and energy resources, and environmental protection. 5. SIC ICWC would inform WG member from Turkmenistan and ICWC members on the results of the meeting. WG members expressed gratitude to Uzbekistan, SIC ICWC, and CAREC for their support in organization of the meeting in Tashkent.